The Informatics Development Institute (IDI) is a not-for-profit company, established in Ireland, with the mission of furthering the global development of both information and communications technologies, and researching their socio-economic impact. The mission is the provision of cost-effective communications for remote regions of developing countries. In 1999 the IDI secured European Commission backing for a communications network project, entitled TRINET, targeted at developing countries in Africa. Current partners are located in Ghana, Uganda, Zambia, and Zimbabwe, and use a low-earth-orbiting satellite (LEOSAT) for store-and-forward email communication using amateur packet radio technology, and internet email gateways in developed countries. The management summary of the final report can be obtained on request as a 7 page PDF file. We are seeking to contact other interested parties in order to prepare proposals for a continuation of TRINET. If you can offer technology expertise in the area of low-cost satellite communications, please download the report summary above and then contact us for further discussions. 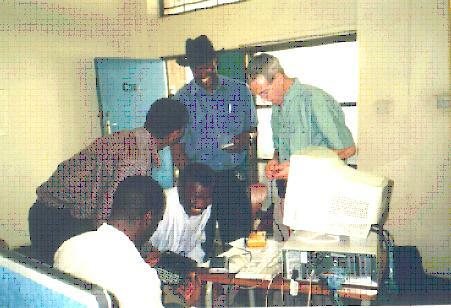 One of the training sessions during the TRINET Workshop, held in Copperbelt University, Kitwe, ZAMBIA, in October 2001. Mr. Tom Fallon from IDI/Dublin Institute of Technology is on the right. The attendees are from CSIR (Ghana), NARO (Uganda), NUST (Zimbabwe), and CBU (Zambia). http://www.europaworld.org EuropaWorld reports on international development and humanitarian actions of European institutions, Governments and NGOs, including European based United Nations agencies. Europaworld is a free, downloadable weekly newspaper covering development and humanitarian actions by European institutions. http://www.euforic.org/ Euforic: Platform for debate and information on Europe's international development cooperation, with thousands of full-text resources from more than 55 organisations. Global Knowledge for Development (GKD) is a moderated discussion list that examines how information/communications technologies (ICTs) can contribute to developing countries' efforts to improve economic, social and political conditions for their people. Supported by UNDP, the World Bank, and UNESCO, GKD has 1000+ members from 78 countries around the world, with significant representation from developing countries. Launched in April 1997, in support of the Global Knowledge Conference (Toronto, June 1997), GKD was considered by conference evaluators to be "one of the most exciting and interesting aspects of the conference." GKD continues to provide a unique and important forum for a vibrant discussion of issues related to ICTs and development. Do *not* put anything after <gkd>.� You will receive a Welcome Letter to the GKD List. Global Knowledge list, as well as archives of GKD messages. (EDC), a nonprofit organization.� EDC is directly supported by UNDP, UNESCO, the World Bank and the Global Knowledge Partnership for the activities in this project. Copyright � 2000-2004 Systems Modelling Ltd., Tara Hill, Gorey, Co. Wexford, Ireland.